January 22, 1984 The 96 foot trawler Mary Lou rolled over and sank off Cape Decision after being hit by a large wave on a trip from Seattle to Kodiak. Three crewmembers survived and two were lost. Lost were skipper and part owner Tom Hansen (33) of Seattle and Fred Blanchard (25) of Portland. February 14, 1984 14 people were lost and 8 rescued when the Japanese trawler Kyowa Maru No. 11 collided with the Anyo Maru No. 15 approximately 120 miles N of Atka. March 15, 1984 Frederick Clark from Kodiak was lost when he fell overboard from the George W while working on deck in Ugak Bay. May 21, 1984 Herring spotters Greg Curley and Walter Hansen died in a mid air collision over Togiak. May 21, 1984 Douglas Bangs of Anchorage and two friends were lost when their boat disappeared while halibut fishing near Kasilof. July 21, 1984 Hal Dierich, Jack Johnson, Harold Martin and Fred Monson were lost in a plane crash near Black Point, Spruce Island. July 23, 1984 Bellevue, Washington businessman Herbert Clausing was lost when his 28 foot cabin cruiser Wild Canary sank in Chatham Strait north of Port Alexander. August 2, 1984 Jess Eggemeyer was lost after falling off the dock in Larsen Bay. 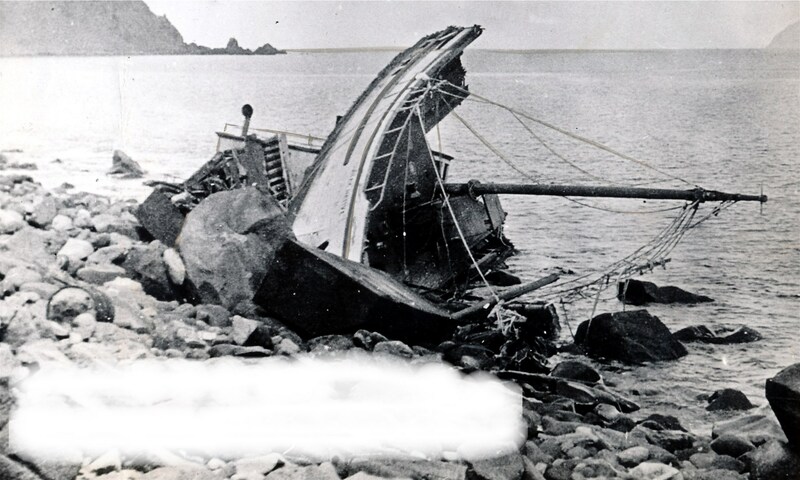 September 30, 1984 The 48 foot wooden fishing vessel Curlew sank in a rescue attempt of the fishing vessel Kelly Ann in the Shumagin Islands. She was towing the Kelly Ann when the disaster took place. The Kelly Ann cut the towline as the Curlew foundered and managed to start her engine, avoid the nearby rocks and save Ray Miller from the sinking Curlew. Lost from the Curlew were David Miller of Kodiak, Jeff O’Donohue and Phil O’Donohue. November 20, 1984 Darrel Dickenson (11) was lost when the seiner Dotty G flipped in 90 knot winds while at anchor in Zaikof Bay on the northeast coast of Montague Island. December 26, 1984 Roger Arlo (Butch) DeGrote from the fishing vessel Scorpio drowned in the Kodiak Small Boat Harbor. Why is there no listing for S.E.S. Propeller? Sank near Wrangle Narrows either late July or early August 1984. All I have on the Sea Scout Ship Propeller is a newspaper report from August 27, 1984 with details of the grounding of the Propeller. According to the Daily Sitka Sentinel, 19 Sea Scouts and 5 others were rescued by the U S Coast Guard Cutter Cape Hatteras and the distressed vessel provided with de-watering pumps. The vessel was partially submerged but expected to be re-floated. The incident took place off of Level Island about 25 miles south of Petersburg. As far as I can see, no wreck report was filed. This vessel is still listed as active on the U S Coast Guard CGMIX PSIX website. There are hundreds of sunken vessels still on the Coast Guard vessel lists because no formal paperwork was ever filed. This may be one. Do you know for sure if this vessel was lost? I am surprised that no paperwork was filed. The SES Propeller was on the reef two or three days at most. It was not likely it could be refloated because the keel was broken. Locals stripped it of valuables. Then it slipped off the reef and could not be located. I will do some more research and see if I can’t find more information. In the mean time, I will add the Propeller into my lost vessel files and update all publications to reflect the loss. Thanks for the information. Roster of the crew aboard the S.E.S Propeller When the vessel ran aground near Level Island, Alaska, on August 25, 1984. Skipper: Raymond E. Gillespie, Sr. Thanks Debbie. I will be entering the SES Propeller into my books and files in short order. The Crew was rescued by the Coast Guard Cape Hatteras (an Inflatable Boat) transferred to a fishing boat called the Defiant, then transferred to the Otter who took us in to Petersburg, Alaska. I have the video transferred to Digital and the Petersburg Pilot did a story on the Rescue August 30th, 1984. Unfortunately the Propeller slipped of the Reef to never be seen again. If you would like a copy of the book I have an extra one and the video, please send a private message. Thanks again Debbie. I have a new book coming out in the coming weeks and will be sure to send you a copy in return for your efforts.